"I came to realize that, because of him, drumming no longer was just time, it was music." 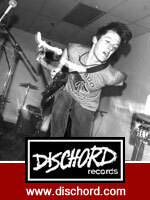 Our pal JC points us toward a damn fine link to a damn fine site -- Record Store Review, "the worldwide directory for serious music buyers featuring stores from over 600 cities." As they explain on the site, "The premise is simple. Most record buyers travel around from time to time and their first concern in a new city is to find where the best stores are. Often, this isn't even about the records themselves, but the fact that record stores are often located in the more interesting parts of town and are run by people knowledgeable in local fringe interests." 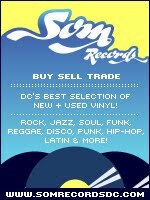 A search for DC area stores reveals some hits and misses...while they locate the new-ish Red Onion Records, they still have Smash in Georgetown, two (?) listings for the defunct Revolution Records, while there's no listing for Som Records at all. But, all in all, minor quibbles for such an exhaustive global resource. Cheers to Gunnar Van Vliet for his efforts. Go show him some love and hell, buy a shirt while you're at it.